The grand finale celebrated India Modern – the perfect intersection between the old and the new, the traditional and the contemporary where indigenous textiles and techniques were combined with fresh shapes and styles. 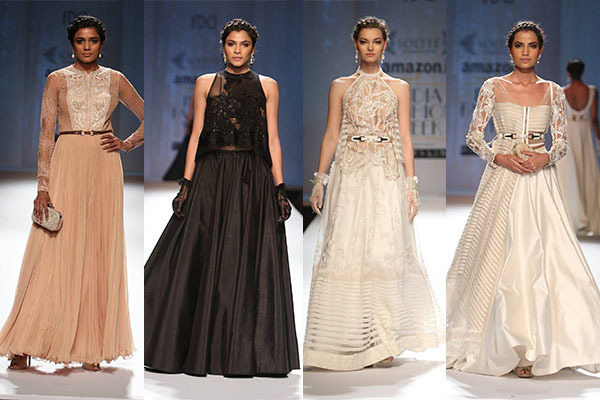 Sulakshana Monga presented an ethereal line up of net embroidered long dresses, halter tops, cowl draped short jackets, tube dresses and floor grazing gowns in ivory and black. Printed silk lehengas in brick reds, blues, and greens and long kurtas with subtle gold floral embroidery paired with lehenga skirts. 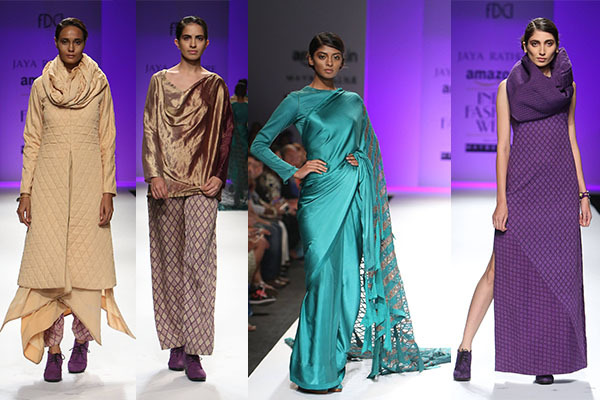 An understated ethnic collection with versatile separates at Joy Mitra. Glam velvet-play on long hem dresses, sequined capes, twin sets and pleated wispy dresses with gold embroidery work spotted at Kartikeya. Jaya Rathore presented simple and elegant pieces such as racer-back long dresses, kedia tops, cholis and bomber jackets along with peekaboo cardigans, wrap around jackets, saris with fringe and dresses with tassel details. Gauri and Nainika revisit their love for flowers and colour through striking shapes and shades of the pansy. 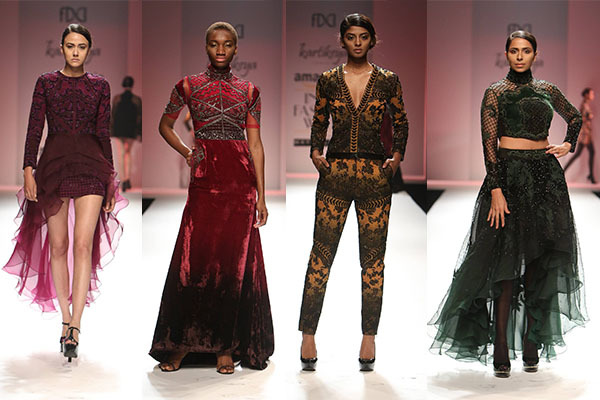 They presented a mix of solid colours and bold prints on soft ruffles, stone embellishments and floral appliqué dresses. The elongated hems and silhouettes stirred up the cocktail chic vibe of their collection.